Choose from the wide array of options for advertising at Think Tasty. We run our own ad serving software and are able to rotate multiple banners for you and also do frequency caps, if you so chose. Placed within an article that is published on the homepage. Can be permanent and will run the cycle of our publication, starting on homepage. 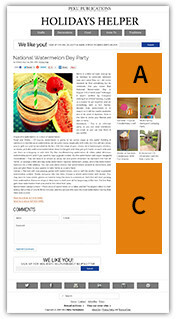 Placed over current site background to add branding elements that frame in the page content. 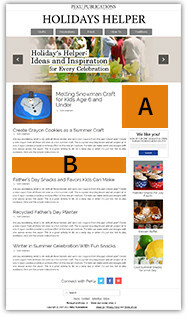 Provides additional branding space that is present throughout the entire page. Can have up to three links of your choosing. Must be on the topic of the chosen publication (e.g. you can’t post a health related posting on our auto racing publication). Will have an image that says “Special Advertising Section”. This image has no alt text. Is permanent and runs the cycle of our publication, will display on the homepage during its cycle. Our minimum is a $50 advertising purchase, but for any purchase over $100 we will discount by 20%.